Power electronics are also a critical factor in determining the range of an electric car. ZF has therefore developed a particularly efficient generation featuring power semiconductors made of silicon carbide. Find out more about this important system component for electromobility. Johannes Winterhagen When things get really complicated, the journalist for energy and mobility topics is in his element. He prefers to meet engineers in the laboratory. Just a quick tap on the accelerator is all it takes to launch the vehicle with a powerful thrust from a standstill. Many drivers who drive an electric car for the first time are surprised and excited about how sporty such an electric car can be. Automobile engineers are more relaxed about it. After all, they know that the fuel required by a combustion engine is first pumped to the fuel injector and then, under high pressure, to the engine's cylinder. In an electric car, on the other hand, the battery is the tank. The source of energy or power that it stores is made up of electrons, nearly massless elemental particles that can move around at the speed of light exactly in accordance with Einstein’s Theory of Relativity. In reality, though, the resistance inside the lines slows the power down somewhat, but it nevertheless travels much faster than either liquid or gaseous fuels. This difference explains why an electric motor can reach the desired speed in fractions of a second. As long as the voltage is constant, the mechanical energy generated is solely dependent on how many electrons it generates in the windings of the electric motor. What does this mean in practice? The flow of electrons must be precisely controlled in order to adapt the power of the electric motor to the driving situation. Even an electric car needs a type of injection system, which is handled, in this case, by the power electronics connected to the electric motor. On top of that, power electronics have another important job. The vehicle battery, a lithium-ion battery, can emit and receive direct current exclusively. Modern electric drives in cars, however, always use alternating current, and its generation is controlled by power electronics. If the vehicle brakes and the electric motor acts as a generator, the alternating current generated must be rectified before it can be stored in the battery. “As in everyday use, the power in the power electronics continuously occurs in both directions, the efficiency of the power electronics is decisive for determining how far an electric car can go on one battery charge,” explains Dr. Marco Denk, who is responsible for Advanced Engineering for Power Conductors at ZF. Modern power electronics, such as the systems that ZF develops at its Bavarian Auerbach location, already achieve more than a 95% efficiency level in the WLTP cycle. In power electronics, semiconductors are significant components that determine the level of efficiency. Similar to how the opening and closing of fuel injectors regulate the fuel volume, these semiconductors block the path of the electrons in an idle state. Depending on the design, the semiconductor clears the path – either by creating a voltage on it or by generating an electric field. These processes can also be combined. This scenario involves an insulated-gate bipolar transistor or IGBT, for short. All power semiconductors deployed to date in electric cars have one thing in common: They are based on pure silicon. This has many benefits, including the fact that the silicon crystals can be manufactured and further processed using the same processes as for computer chips. With the same battery performance, power electronics with chips based on silicon carbide promise a range of the electric vehicle that is five to ten percent greater than that of silicon-based power electronics. The reverse voltage of a silicon semiconductor – in other words, the pressure that the electronic valve has to resist – depends almost entirely on its thickness. 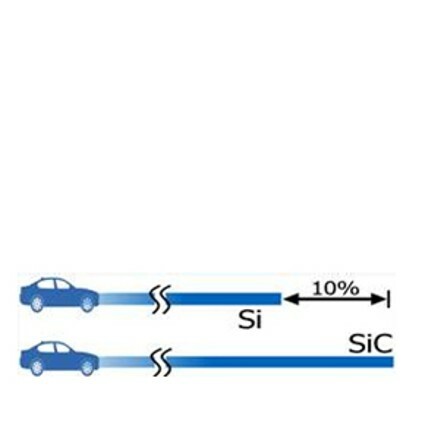 The implication is that as voltage increases, so to does the size of the semiconductors, which reduces the level of efficiency when the vehicle is in operation. “While motors in all electric cars have so far worked with 400 Volts, 2019 will see the market launch of the first vehicles powered by an 800-Volt drive. The reason for doubling the voltage is not due to driving advantages, rather the increase has reduced the associated charging time by half,” explains Denk. In the near future, it will take only 15 to 20 minutes to charge enough power to drive 400 kilometers. In light of this, ZF has been working on a new generation of power electronics. It is based on power semiconductors made of silicon carbide. In this material, each silicon atom is bonded to four carbon atoms – and vice versa. “The silicon structure is similar to that of a diamond,” says Dr. Marco Denk, adding: “carbon atoms are not only smaller than their silicon partners, but the free electrons bond closer to one another.” Field strengths ten times higher and up to three megavolts per centimeter can be generated on the more solid material before the mesh structure tears. In practice, this means that the same voltage can be processed using chips that are ten times thinner. For an 800-Volt drive, semiconductors with a thickness of roughly 100 micrometers are sufficient. The reduced design height also means a lower internal resistance. Accordingly, fewer electrons are lost on their way to the engine – thus increasing the level of efficiency. Drivers also notice this progress, even if they don’t understand semiconductor physics because: “Without changing the battery size, these new semiconductors can increase the range by five to ten percent,” explains Denk. He and his colleagues are still working on the volume production capability of the new semiconductor material. However, within the next five years or so, ZF wants to offer the first power electronics systems featuring semiconductors made of silicon carbide. In brief: When it comes to the range of an electric car, battery capacity is not the only determining factor, but also the efficiency of the power electronics. That is because it is responsible for the entire energy management. Today’s power electronics contain semiconductors made of pure silicon. Though they already achieve a high level of efficiency, there are also disadvantages in the design height and internal resistance. The higher the voltage that powers the electric motor, the greater this disadvantage becomes. ZF is therefore working on a power electronics system based on silicon carbide. This material reduces the above disadvantages and could lead to a five to ten percent increase in range on the road without having to change the battery size.